In a soup pot heat the olive oil over low-medium heat. Add the carrots, garlic, salt, pepper and ginger and sauté for 10 minutes. Turn the heat up to medium and add in the broth, cashews and carrot tops. Stir and bring to a gentle simmer, continue to cook at a simmer for ten minutes. Remove the soup from the heat and add in the apple cider vinegar and stir. Transfer to a blender and process until smooth. Serve warm. The color of your soup may vary based on the color of your carrots. Any variety of carrot (orange, purple, red, etc.) 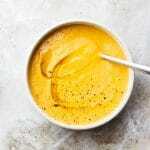 will work beautifully in this carrot ginger soup.